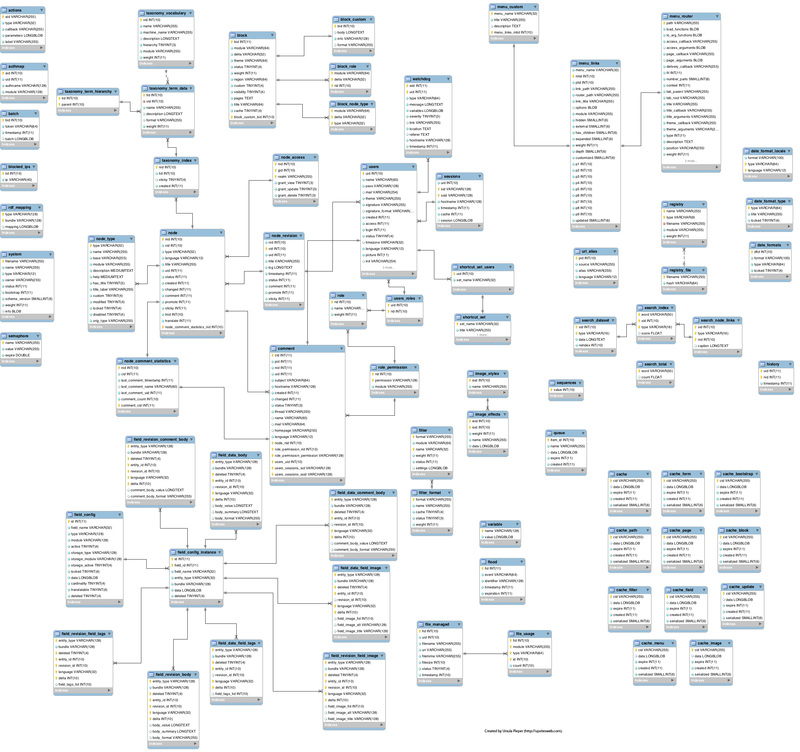 A while ago, the data model of Drupal was discussed in the LinkedIn Drupal group. A number of good pointers to data models of D6 and D5, and one for CiviCRM came up. However, it doesn't seem that a D7 data model is available online. This is my first go on creating a Drupal 7 database schema. I used all modules enabled in the "Standard Installation". It was created using MySQL workbench. The schema certainly needs revisions. Feel free to leave a comment,and I'll incorporate the revision. The usefulness of this data model in Drupal programming is debatable, especially since many regularly used contributed modules are missing. However, the creation of the model helped me to further understand the Drupal 7 structure, and made me more familiar with the dependencies, thus the creation was helpful and educational. fndtn357 (not verified) - July 9, 2011 - 10:03am. I just downloaded it to look at for awhile. Thanks for taking the time to start documenting this. I will try to find time to add to this if I can. ursula - July 15, 2011 - 9:47am. Thanks, any additions are welcome! It took me a month to actually put this up, after I made it, and sure can need a refresher, by going through it again. Bev (not verified) - November 12, 2012 - 7:08pm. Anonymous (not verified) - December 3, 2012 - 1:12am. Moving a blog from wordpress to .NET would be plain stupidity in 98% of all thinkable cases. Why replace a well established system used be millions of sites with an incredible amount of modules, themes and information with one that barely anyone knows and that might be gone in a year? kirkilj (not verified) - July 15, 2011 - 7:02am. Yours is cleaner than the one I came up with. Thanks for doing this. Zhatakk (not verified) - July 22, 2011 - 10:09am. to load but it was worth it. Anthony (not verified) - July 24, 2011 - 8:16pm. Thanks. 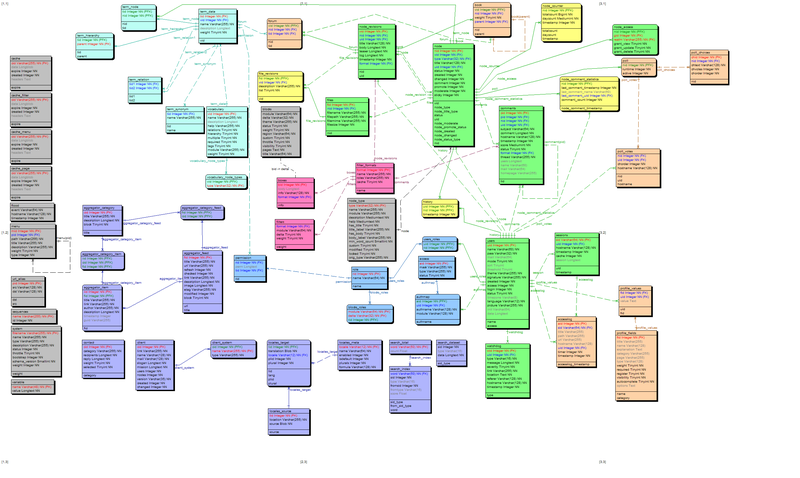 I love getting the database diagrams. Couldn't wait for a Drupal 7 one and this one is perfect. I put it up on my wall. zaurav (not verified) - September 30, 2011 - 11:49am. How did you get the relationship lines? I'm using MYSQL Workbench to reverse engineer my db and I get the Diagrams but no relationship lines. Could you help me out? Thanks. ursula - October 22, 2011 - 11:26am. Hi, I added the relationship lines manually, by looking at the tables, and using workbench's tools. It made me look at each table, and understand the relationships. optimizacijasajta (not verified) - June 2, 2012 - 4:43pm. Good article. I will be facing some of these issues as well. Herman Sentrigos (not verified) - December 14, 2011 - 8:49am. That's a cleaner code than mine. AmirHossein (not verified) - January 3, 2012 - 4:57am. Jeffrey Schrab (not verified) - January 28, 2012 - 3:14pm. I have some D7 to D7 database black magick I need to do in the very near future - finding this is VERY timely! Thank a mint for sharing! Anonymous (not verified) - February 15, 2012 - 7:21am. jaffa (not verified) - June 13, 2012 - 4:21am. The utilization of databases is now so widespread that virtually every technology and product relies on databases and DBMSs for its development and commercialization, or even may have such software embedded in it. Also, organizations and companies, from small to large, depend heavily on databases for their operations. Thanks. Gyozo Kudor (not verified) - March 6, 2012 - 12:11am. Hello thank you for this, can you upload the mwb file somewhere? So I can open it with mysql workbench? Thanks. ursula - March 13, 2012 - 5:10pm. I added the file to the page. Enjoy! Guillermo (not verified) - September 6, 2012 - 3:06am. Moshe (not verified) - October 5, 2012 - 7:27pm. I neеded to thank уou for this fantаstic read!
! I definitеly enϳoyed eѵery little bit оf it. Anonymous (not verified) - September 8, 2012 - 4:41am. jungyi (not verified) - October 19, 2012 - 5:06pm. Michael (not verified) - November 15, 2012 - 5:10am. Great resource! Thanks for sharing! pedram (not verified) - January 22, 2013 - 6:28am. Dani (not verified) - January 24, 2013 - 1:28am. Peter Kehl (not verified) - September 5, 2013 - 6:47pm. I believe field_data_body.entity_id is a foreign key, that points to various tables, depending on value of field_data_body.entity_type. If field_data_body.entity_type='node', then field_data_body.entity_id joins on node.nid. I'm new to Drupal, so I don't know whether it joins to any other tables. You could 'SELECT DISTINCT field_data_body.entity_type' from a populated instance and see. Matthew (not verified) - September 26, 2013 - 10:15am. I'm not sure how you got the crow's feet to point away from the user_role table but they should be pointing towards the user roles table in a many to many relationship. Matthew (not verified) - September 27, 2013 - 3:45pm. My mistake at interpreting the ERD. I am still learning my way around sql workbench. There is no error here. ursula - September 27, 2013 - 6:40pm.